I have written a couple times about exercise and how important it is for all of us to do something physical at least a few time a week. Well, I am challenging you to take it to the next level. Last winter I started running at the gym and set the goal for myself to be able to run 3 miles fairly easily. I thought that is where I should be considering my age and physical ability. I acheived that goal and have pushed on to bigger and better distances. Now in just under two weeks I am signed up to run The Crim, a 10 mile race in my area. And, in October, I signed myself up to run a half marathon, The Brooksie Way. This scares me a little, but I know a lot of people that did it last year and have a lot of friends working toward it this year so why can't I right??? As I was researching half marathon training schedules, I was a little nervous that they were going to expect me to run long distances several times per week, but I was pleasantly surprised to see that shorter runs are an important part of the training schedule. I am not a natural when it comes to running and don't want to injure myself by pushing too hard. So next time you are contemplating your workout it may be nice to have your own fitness goal. Maybe your goal is to be able to walk a mile, run a mile or to run a marathon. No matter what, it feels good to set goals and reach them. My big advice, make them acheivable. 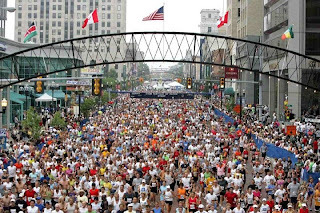 Don't start out with the marathon if you are not much of a runner. That is just discouraging. Take baby steps and enjoy your successes along the way. Absolutely! I have set myself the goal of being able to run 5K. It won't be this year, but every day takes me closer to the point where I can start actually training for that.